Yesterday I was faced with the challenge of replacing the stock radio in my vehicle. The stock radio had broken, and it was time for a new one. As it is, building the proper wiring harness is already not easy... better pull out your wire stripers and electrical tape. But to make the challenge even harder, they colour coded everything (including the use of blue, purple, and violet). This did not make it easy for me! I am colourblind myself and rarely can differentiate blue vs. purple and purple vs. violet. In fact, for most of my childhood I actually believed violet was simply just a different name for purple. To overcome this, I pulled out an app for my Android phone that allowed me to differentiate colours using the camera, and the project ended up OK... but had I not had this app, there would have been a very good chance my rear left speaker would have become my FM radio antenna. 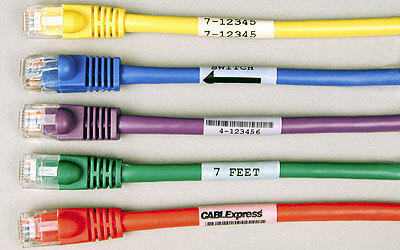 Color coding is one of the basic covenants of design and usability. To flaunt the significant benefits of color coding away purely on the varying needs of < 10% of the population would not be at all appropriate. There are multiple types of color blindness, so while one color might not work for some "color blind" people it will do just fine for the rest. To throw away color would actually be catering to far less than 10% of the population as a result. There are also color blind safe palettes that can be used to compensate for the various different color deficits. 4. Use color to convey structure - wire bundles are structures. 7. Use color to improve usability - well... yeah! 9. Use color to show associations - this is exactly why wires are colored, so you can splice the correct two together. The two simplest ways to prevent issues with colorblindness on wires is to, (1) use color blind safe colors, or (2) better yet add a label. 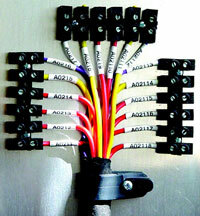 Making a wiring system not depend on colour is easy. Making it cost effective is another question. The other answers have excellent ideas (bumps, labels etc) and they work fine in low-volume or custom installations like a datacenter, or ultra-high-cost products like commercial aircraft. Another way is to use a tracer. Telephone rooms have literally thousands of terminations even in a small office building, and they typically use one kind of cable: blue/white striped (pair one of 50, a telco standard for >50 years). And zero labels anywhere ;-O How do you find which one to use? Handy device called a toner. Plug transmitter into the phone jack in office #302, wave the receiver around like a Star Trek tricorder. Even sounds similar. Correct wire found in 30 seconds. In the OPs example, colour coding won't go away as there's no reason to change it. The inner wiring of your car is not a user-serviceable area so the manufacturer has no reason to spend more money for no benefit. The colour coding is for their own purposes (it would be just as easy to go all black) and they can easily make normal vision a requirement for their technical staff. Legal, as the colour-blind people (even b+w vision) can be routed to engine servicing where everything is either metal or coated with grease. After a good deal of thinking (partially inspired by PlasmaHH's comment) I came up a solution that would allow even the most visually impaired to identify wires. Using a combination of 2 wire colours, black and white (which are actually shades), plus 4 grey and opposite colour stripes, and a starting position indicator, a thin blue stripe, a combination of 32 different wire codes are available. The stripe system could be placed every 5 cm along the wire, allowing for easy reading no matter where along the wire you are. The first letter indicates wether the wire is black or white. The next four digits indicate the stripes: 0 for grey, and 1 for the opposite wire colour. The blue starting indicator prevents the binary stripe code from being read upside down. This binary stripe system could work in any language, not requiring labels in a specific language. A wiring instruction guide could be placed at the beginning of the manual, teaching the user how to read the code. Even the heavily visually impaired could read these wire codes. The only requirement is that you are not totally blind. And most importantly, it is cost effective to manufacture. 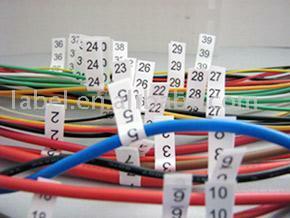 Labels, bumpy wires, or even smelly/tasty wires would add a significant amount to the production cost. If 32 combos are not needed, a three stripe system could be used for 16 combos, or a two stripe system for 8. If a higher number of combos are needed, a five stripe system could be used for 64 combos, or a six stripe system for 128. You are not the only person to have this difficulty, but barring a new specification from the NEC board, it's not something you can solve for in general. Electric wiring is definitely not a one size fits all problem. In domain specific situations, manufacturers, such as automakers and HVAC vendors, need to provide their own solutions. Some do this better than others. Recently, I installed a replacement thermostat that came with a small set of adhesive labels, and the instructions included identifying the source markings on the old thermostat, attaching the stickers to the corresponding wires before disconnecting them, and they advised me to ignore the actual colors. They also advised taking a 'before' photo with a cameraphone, just in case. During the installation, I encountered no unsolvable problems. Car audio harnesses seem like a place where the installation kit could include more helpful tools, but there are many more variations than just colors and plugs, making it even more complex than a thermostat. Just because the wire goes to the rear speaker still doesn't make it electrically compatible: it could be a 4 ohm speaker being tied to an 8 ohm amplifier output. Standardized wire markings there could provide a false sense of security. 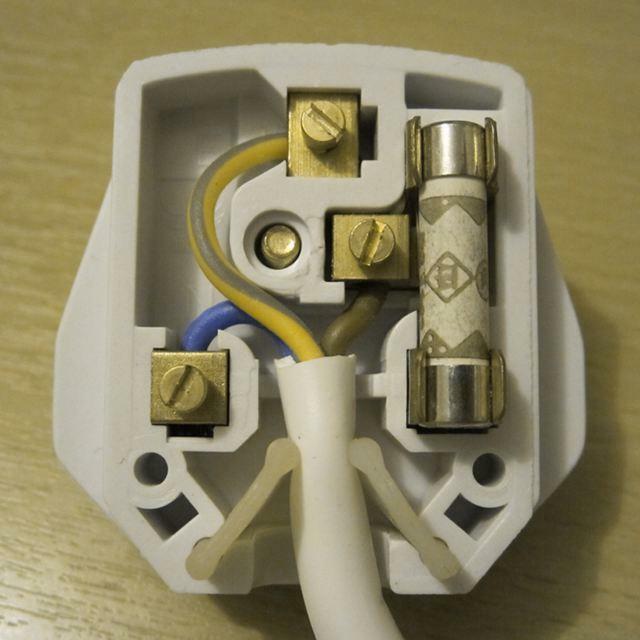 Extension cords in the US have a ribbed side and a smooth side. This is to identify the hot wire in the circuit. This technology is already in place and is being used daily. It shouldn't be hard to modify the number of ribs to allow more than two options. My vote for this Poll is no, color coding should not be outlawed. The reason for this is that although a user experience practitioners job is to seek out the most usable or accessible interface, product, or service, we are also required to try and meet user expectations. We have many different senses that designers can target as inputs or outupts for their designs. In each of the senses, there is likely going to be a margin of folks who have difficulties. Color is one of those that there are a margin of folks that can't differentiate. It is still an effective means to communicate to a larger group of folks who don't have the trouble. Maybe a best solution would be to combine two senses to help eliminate accessibility issues. 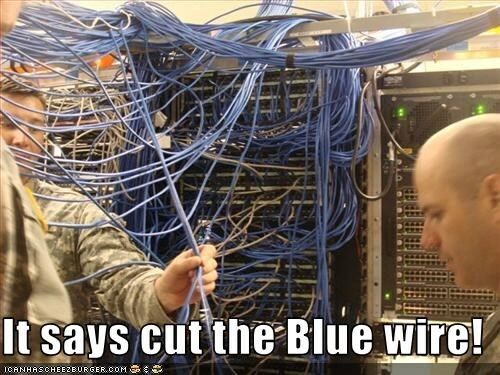 Maybe the wires would taste different, or smell different! ha-ha, wouldn't that be fun. Wires could have little bumps at the end of them (for wires that have an end point like lan cables) or in regular intervals (like every 5cm). Then just map number of bumps to colors. So e.g. 1 bumps = red, 2 bumps = blue, etc. This would of course work best if some kind of standard was developed and ideally enforced by law. As this is not likely to happen, you could probably also build something like this yourself. Just use thin tape and tape it around the end of the wire. Do this once using an app or a helping non-colorblind person, and you can now differentiate between you wires. Being able to identify cables by touch might also be beneficial for non-colorblind people as well, for example in dark rooms, under the table, in closets, etc. For colorblind people, labels are probably easier to use, but for people who cannot see that well, touch would be a nice alternative. I prefer physically incompatibility. If all live wires were finished with a triangle, all neutral with a square, earth with a D etc. And all junction boxes, connectors etc appropriately shaped it would be extremely difficult to make a mistake. take putting petrol in a diesel car, with appropriately shaped nozzles and fillers this would be impossible. Of course this needs designing in at the outset as retrofitting would normally be prohibitively expensive. Not the answer you're looking for? Browse other questions tagged accessibility physical color-blindness colours or ask your own question. How does use in bright sunlight affect how a web site should be designed? How could petrol forecourts be designed to improve efficiency? Can someone who is colour blind pursue a career in UX?